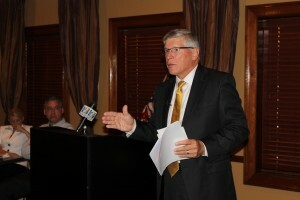 New East Baton Rouge Parish schools Supt. Warren Drake said Tuesday that finding great leaders to serve as principals and in other key positions will be critical to the school system’s success. “If you find a great leader, you can put him anywhere, and he will be successful,” he said. Drake said he is looking for leaders with vision, who understand that this is not just a job but a calling. Drake, who took office July 1, led the Zachary Community School System to be ranked No. 1 in Louisiana for 10 straight years. He will have his work cut out for him in EBR, a district with a D-ranking. Drake launched a 100-day plan to make major changes in the school system, and that plan is already paying off, he said. One immediate change is focusing on “customer service,” just as a successful business would do. Drake said school employees have to treat taxpayers and parents as though they are the owners of the schools, because they are. Another immediate change is a focus on the physical appearance of each school from the road. Drake said schools must be clean and well maintained in order to instill pride in students, faculty, parents, and the community. He is working with principals and the maintenance company to upgrade the appearance of district schools. Anyone visiting a school will also see that the dress of teachers will improve. One of the most significant changes is restoring discipline in the classroom, he said. When a student disrupts the ability of others to learn, he must be removed from the classroom and placed elsewhere, Drake said. The goal is to create an environment where teachers can teach and students can learn, he said. The new superintendent said he is not against charter schools, private schools, or home schools. “The reason we have them is that our public schools are not performing the way parents want,” he said. “But our schools are going to become better and better, and there will be less need for alternative schools,” he said. “Competition is good, and we have to get better,” he said. The superintendent said he understands how important his job is and how much the Baton Rouge community is counting on him. The superintendent said people might be surprised to learn that he believes three of the most important people on any high school campus are the football coach, the band director, and the custodian. He said he wants more men involved in the system, both as teachers and as mentors. “Our youngsters need father figures today,” he said. On the issue of St. George, Drake said he wants the same thing that supporters of St. George want — quality, neighborhood schools. “I want you to be able to move into a neighborhood and know where your child will go to elementary school, middle school, and high school,” he said. Neighborhood schools are now one of the six priorities of the East Baton Rouge Parish School System, he said. “Football Friday nights with Memorial Stadium packed out were one of the great events of this community. And we’re going to bring those days back,” he said. Metro Councilman Ryan Heck asked the superintendent his policy on magnet schools. Heck said none of the high performing school districts in the Capital area has magnet schools. He wanted to know how Drake could rectify having neighborhood schools with having magnet schools. The superintendent said many changes will be made before the school year begins in August but many more changes can be expected by August 2016.